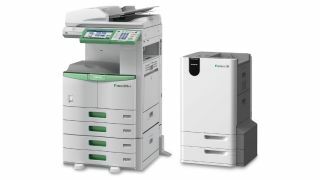 Toshiba has claimed a world first in launching a multi-function printer (MFP) capable of re-using ordinary copier paper multiple times by using burning off print toner to leave a clear surface. While companies such as Canon are increasingly offering cloud-based printing solutions in a step toward electronic document storage, Toshiba has recognised that some businesses aren't quite ready to leave paper-based workflows behind. Toshiba's e-STUDIO306LP/RD30 uses erasable toner technology in which a used sheet is fed into the machine to heat toner until the print is de-colourised and disappears. It can automatically detect if a sheet is reusable and places spent sheets in a separate tray. To avoid documents being accidentally wiped, it electronically converts what is fed into the printer into a file stored in a document management system (DMS) for retrieval over a network. Toshiba gives a "conservative" average estimate of five re-uses and claims it can reduce paper and waste costs by 80%. The Japanese giant says that although erasable technology isn't new, the e-STUDIO306LP/RD30 differs from comparatively pricier machines as it does not require a special type of plastic coated paper for it to work. It is aiming the machine at businesses that need to keep paper documents temporarily.